My introduction to alpha hydroxy acids(AHAs) came by the way of PIXI Glow Tonic. I knew acid toners were good for my skin and should be part of my skincare regimen but I didn’t know why or how to choose which would be best for my skin type. For a period I bought almost every acid toner I discovered and it took a while for me to realize there were different type’s acids and some worked better for certain skin conditions and types than others. In this 2 part series, I will share what I have learned about acid toners, the types available, which skin conditions address and some of my favourite products in each category. Hydroxy Acids or acid toners as they are popularly known are naturally occurring acids derived from various ingredients. The synthetic forms of these acids are used in cosmetics in the form of hydroxy acids to exfoliate skin cells. There are three types of hydroxy acids, Alpha Hydroxy Acid (AHAs), Beta-hydroxy acids (BHAs) and Poly Hydroxy Acid (PHA). 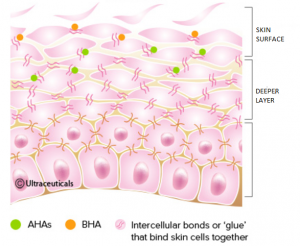 AHAs and BHAs are the most widely available, while PHAs (Polyhydroxy Acids) are relatively new.PHAs are an alternative to AHAs combined with other actives or as an alternative for with AHA sensitivity. This is derived from sugarcane and is the gold standard for AHAs because of its ability to penetrate the top layer of skin due to its small molecular size. It is also the safest option for all skin tones especially darker skin which is prone to hyperpigmentation. In addition to skin penetration ability, it controls sebum production and hydrates the skin by “teaching” it to retain moisture. Glycolic acid is often used alone or with other AHAs at concentrations of up to 5% to enhance the firmness of skin and reduce the signs of sun damage. Is derived from milk and the most frequently used AHA in skincare because it is easily stabilized and provides consistent results. Due to its larger molecular size lactic acid is milder than glycolic acid and less able to penetrate the skin and less likely to cause irritation. In addition to its exfoliating properties, it is antimicrobial, increases hydration and inhibits pigment formation. Lactic acid able to improve the moisture barrier allowing skin maintain its moisture balance and provided hydration in concentrations above 2% when used alone or with other AHAs, but is exfoliating at concentrations between 5-10%. A derivative of bitter almonds with a large molecule which allows for slow even penetration. Mandelic acid provides gentle exfoliation making it suitable for delicate and sensitive skin types to brighten discolouration and control acne due to its antibacterial properties. It should, however, be used with caution on oily skin as it can cause increased sebum production making it a better choice for people with dry skin. This is derived from apples but is less than glycolic or lactic acid so not used alone in skincare. Despite its larger molecular size is a useful exfoliant when used in combination with other AHAs. 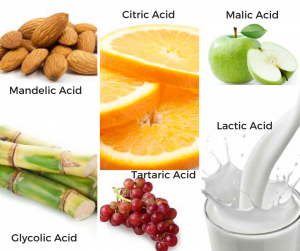 Malic acid has antioxidant and humectant properties which can be soothing to people who do not tolerate glycolic acid. This is one of the better-known acids derived from citrus fruits and popularly known as vitamin C. It is typically used as antioxidant and skin brightener but is exfoliating in concentrations above 10%. Because of its low PH citric acid is irritating to skin but can be used in small quantities to maintain pH, of cosmetic within the required range. A by-product of the fermentation process during winemaking, twice as large as glycolic acid and best used as an additive in maintaining the pH range of other AHAs. 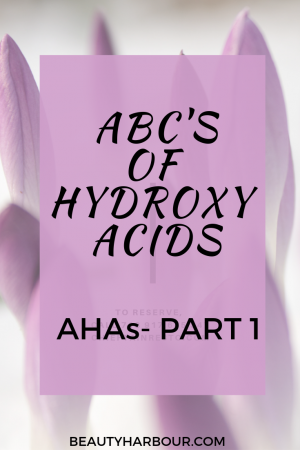 There you have it an introduction to Acid toners starting with AHAs. I have mentioned the most common AHAs used and popular products as well as the skin types and conditions most suited for each type of AHAs. The most important take away is that when using AHA you must use sun protection so as not to exacerbate your skin and cause additional damage. In part 2 I will talk about BHAs and PHAs. If you enjoyed this post you subscribe to ensure you get the content in your email and follow me on Instagram to get regular updates and titbits on skincare and beauty.